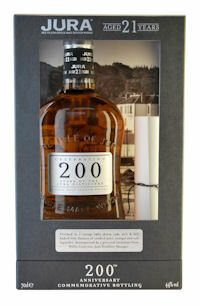 This year marks a special year for the Jura distillery as it is celebrating its 200th anniversary. To commemorate this occasion, Jura is releasing a new limited edition 21yo which will be available to buy direct from the island or through specially selected whisky partners. The distillery, which was founded in 1810, is the only distillery on the island and is home to the award winning range of single malts – 10, Superstition, 16 and Prophecy - with the Jura 21 years old will now sitting alongside the collection. If its maturation in vintage sherry casks from 1963 isn’t enough to tempt the palate, as an added anniversary bonus, each pack will contain an exclusive invitational scroll from Distillery Manager, Willie Cochrane, to a special tasting of rare whiskies at the distillery. There will also be 21 stays at the luxury Jura lodge up for grabs for purchasers of the commemorative malt. The unique vintage 1963 Oloroso sherry casks from Gonzalez Byass have provided this noble spirit with a flawless finish of sot marzipan, crushed walnuts, fleshy pear and tangy orange peel. Whispers of succulent maraschino cherries, plums and soft liquorice complete this memorable masterpiece.